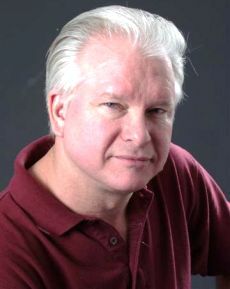 Mark McCandlish is a very interesting fellow. By trade he was an aviation concept artist and in demand by the major aerospace corporations around the world. Mark is interested in a lot of things but UFOs peak his interest as well as conspiracy theories. In this program Mark tells Jerry about he was influenced by a book on the Crash at Aztec which motivated him to go to the crash site and see for himself what the terrain and feel of the countryside in giving him his own opinion about the reality of the crash. Not far from the Aztec location there is the famed Archuleta Mesa near Dulce, NM. Mark decided to find a way to the top which he did and when he arrived it was a very cold, dark night around 1:30 a.m. His plan was to sleep in a sleeping bag until morning but he had an almost paranormal experience which made him jump in his car and leave well before dawn. Mark went to Area 51 as well but the only danger he found himself in there was the fact that the county sheriff's officers evidently like to write false tickets charging people with various traffic violations. Mark also talks about his assignment at the Wright Patterson Air Force Base museum in a tribute to famed aviator Billy Mitchell and tells Jerry some interesting side bar stories about this experience. McCandlish tells of his adventures ina concise easy to understand way that makes him a favorite guest of Jerry with many more appearances slated in the near future. Mark describes night of high strangeness on top of Archuleta Mesa near Dulce, NM. 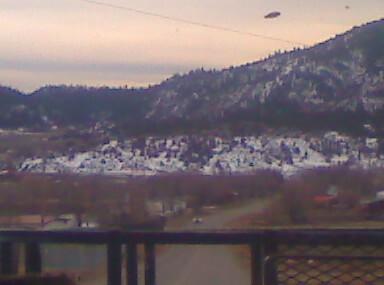 This photo of a flying saucer near the Mesa was taken on March 1, 2011, by area resident, Mr. D. Vigil. 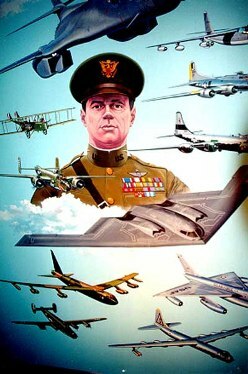 Mark McCandlish has created this 16 X 20 foot hanging mural that was created for the Col. Billy Mitchell Memorial B-1 & B-2 Systems Logistical Support Center at Wright-Patterson AFB, in Dayton Ohio. This huge painting hangs in the lobby of the Logistics Center on a wall to the immediate left of the two story lobby, spanning the first and second floors.